Authorities on Thursday found a 10-month-old boy, who they believe had been abducted by his mother last month, according to the Santa Clara County District Attorney's Office. 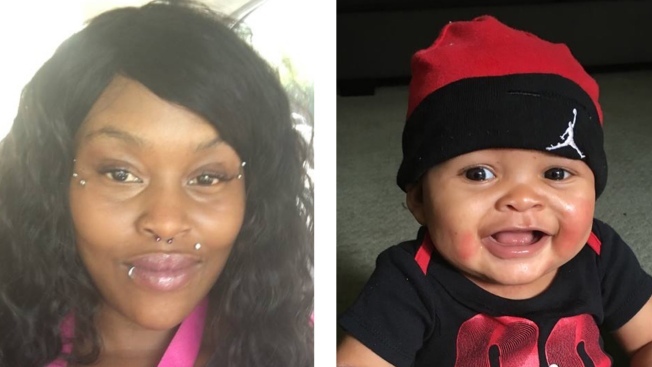 The baby, Davione, has been located, but the district attorney's office said Satima Michelle Purnell remains at large. The 32-year-old San Jose resident is accused of kidnapping her son after learning she lost custody of him on July 9, prosecutors said. According to investigators, Davione suffers from a "serious medical condition." On Thursday, prosecutors said only that he was "safe," but did not comment on where he was found or the condition he is in. Purnell, who also uses the last name Clark, is described as standing about 5 feet 1 inches tall and weighing 120 pounds, according to the district attorney's office. She has brown eyes, black hair and multiple piercings on her face, particularly on her lips and upper cheek close to her eyes, prosecutors said. Purnell also has numerous tattoos including a teddy bear on her left bicep and two on her upper left arm with the words "Aaniah" and "Prince," prosecutors said. She is possibly driving a four-door silver Hyundai with license plate number 6BXN752. Anyone who sees Purnell or has information on her whereabouts is asked to call 911.